Unless you have the luxury of being able to sleep in as long as you like every day, waking up can be a slightly traumatic experience. The blaring of the alarm clock is not a peaceful way to transition from dreamland to the waking world. Designer Aakanksha Rajhans’s answer to that jarring experience is the Acuwake Sock. Rather than using loud audio to blast you awake, the Acuwake Sock uses gentle acupressure and micro-massage to gently transition you into your day. 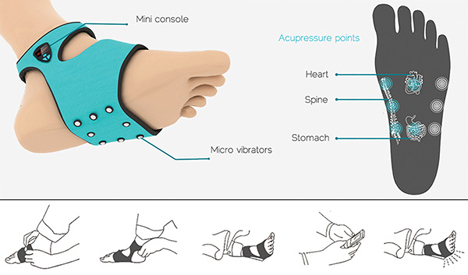 The sock straps onto your foot just before you go to bed; you can then program it using a mini console built into the device or using its accompanying app. If you’re really brave, you can give someone else control of your Acuwake via the app, letting them decide when you’ll roll out of bed for the day. The Acuwake uses acupressure points to stimulate the areas on your foot that correspond to a healthy heart, spine, and digestive tract. In this way it can keep you healthy as well as improving your wake-up experience. An added bonus is that, because it is silent, the sock can wake you without disturbing your bedmate who might appreciate getting a bit more sleep. The electronic portion of the sock is removable so you can wash the sock, but we have to wonder: why would the designer intend for only one foot to get the benefits of the Acuwake? We would definitely want both of our feet tickled awake at the same time.